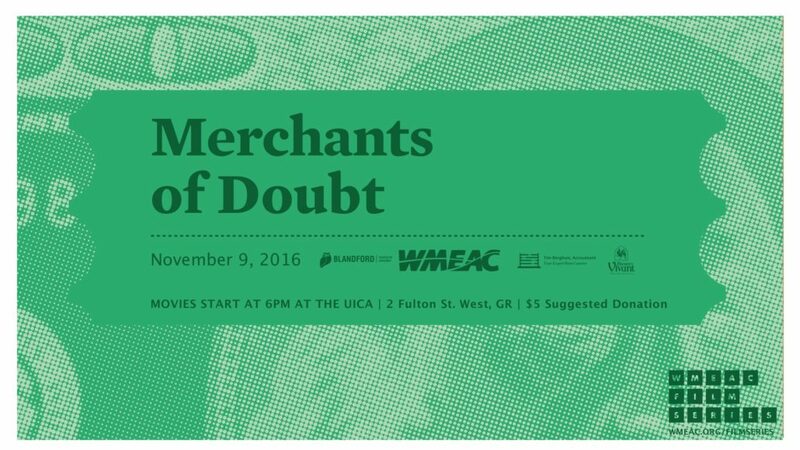 WMEAC hosted the 2014 documentary Merchants of Doubt November 9, 2016. Perhaps the film was a few days too soon (held the day after the election), but the second film in this year’s WMEAC Film Series was as timely as it was engaging. Based on the book of the same name, Merchants of Doubt investigates the individuals and the larger strategies used by corporations and coalitions to muddy the public discourse around certain scientific topics. The use of “experts” who are credentialed to varying degrees is a practice that is centuries old, however, the film picks this up during the beginning of the downfall of the tobacco industry’s era of dominance. At that point, some of the largest cigarette producers found that, without the ability to counter emerging scientific evidence that smoking could cause cancer and other ailments, they had to employ a series of other tactics: change the conversation, muddy the water, doubt the science, or personally attack those producing the science. Although the film sets the stage with “experts” in the tobacco industry, much of the film focuses on a more contemporary (and larger-scale) issue: climate change. Merchants of Doubt traces the issue as far back as the work of Dr. James Hansen, a climatologist empowered by NASA to begin investigating extreme fluctuations in the earth’s climate patterns. His research laid the groundwork for decades of scientific research and debate that has been increasingly corroborated, as the film highlights several of these major steps along the way (An Inconvenient Truth, the IPCC report). Dr. Hansen himself is a terrific focal point for how those of certain political and, importantly, financial leanings, have attempted to insert doubt into the conversation since the earliest days of modern climate change research. These tactics (mentioned above) take many forms. Dr. Fred Singer, a physicist by trade who has taken part of many groups to limit regulation of greenhouse-gas emissions, helped set up the NIPCC. Funded by a prominent right-wing think-tank, the NIPCC released a report in an effort to counter the more academic paper released by the IPCC in 1995, oftentimes copying fonts and the general layout of the original report in the hopes of elevating both reports when physically in the hands of lawmakers. And yet these tactics seem utterly civil compared to the personal attacks that have been unleashed onto climate change researchers and regulation advocates. Marc Morano, a political spokesman who is himself very outspoken, has no formal education in environmental studies. However, since 2009, he has run a climate skeptic website which has been a rallying point for internet trolls to access personal information about prominent climate change researchers such as Ben Santer, Michael E. Mann, and Katharine Hayhoe. In Merchants of Doubt, these researchers and more recount personal threats they’ve received through various channels directed at themselves as well as their families. Unfortunately, many of these tactics are working. Despite the fact that the overwhelming mass of evidence supports the theory that climate change is occurring and is caused by humans (enough so to create the term “scientific consensus on climate change), policies, panels, discussions, and even this very blog post often get derailed. At the WMEAC showing of Merchants of Doubt (held on the day following the U.S. presidential election), there was a panel discussion with two faculty members of local universities who both had extensive backgrounds in studying climate change. Although the mood may have been a bit somber given the recent political results, the WMEAC Film Series continues to program engaging films and knowledgeable speakers to help spread valuable information about the environment, as well as present opportunities for West Michigan residents to help make their surroundings cleaner and more sustainable. The next WMEAC Film Series event will be a showing of Anthropocene on December 7, 2016. This event will be held at the Urban Institute for Contemporary Arts in downtown Grand Rapids.